“He can’t pitch,” Torre said wistfully, reminding everyone the Dodgers’ problem isn’t scoring runs, it’s preventing them. YKI NOTE: Yes, folks – that is probably the last time you see Charlie Haeger in a Dodger uniform. 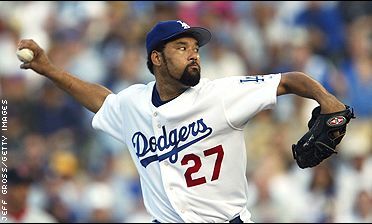 YKI is a fan of the knuckleballer but realizes that Hoyt Wilhelm, the Niekros, Tom Candiotti and Tim Wakefield come around about once per generation, and though Haeger is capable of bewildering foes (12 k’s vs. Marlins earlier this year), he is not the lockdown, consistent starter necessary for the Dodgers rotation. Anybody else think Randy Wolf & Jon Garland would look real nice back in Dodger jerseys? Both local boys were spurned by the organization this offseason in the unofficial spending freeze. How bad was it? The last time a Dodger pitcher got lifted so early was Aug. 8, 1988, when Tommy Lasorda pulled Shawn Hillegas after facing just four Houston Astros. The good news is the Dodgers went on to win the World Series later that season, stunning the New York Mets in the National League Championship Series before upsetting the heavily favored Oakland A’s in the World Series. A Shawn Hillegas reference? Esoteric and well-played; now if the Dodgers can only live up to VB’s writing as they play out the season. . . Manager of the Year – I agree on both selections. First off, I’m very glad to see Jim Tracy recognized. He was unfairly ousted from the Dodger gig (though it ended up working out pretty well for the squad), it was nice to see him win the award. In the AL, I can’t disagree with Mike Scioscia’s selection because of injuries/Adenhart. That said, Ron Gardenhire continues to be overlooked for his brilliant work. A team that was going to be a victim of contraction as recently as 2002 has steered the Minnesota Twins to FIVE first place finishes in the last eight years, with a payroll half the league average. One day he’ll get his due, but until then – kudos to the two ex-Dodgers for winning the awards.